This list below contains all of the Cypress Cove homes and Condos For Sale with all of the real estate companies in the Outer Banks MLS. This list is updated hourly with new properties added and expired and/or sold properties removed. This is the most accurate and up to date list of homes for sale in Cypress Cove so check back often. These homes are just the ones for sale in the subdivision of Cypress Cove. For more listings click on the different subdivisions below. Click on the picture to see the full details of the property listing. If there are no pictures below then there is currently nothing for sale in Cypress Cove. Just built in 2013, this home still feels and shows like new construction. Well suited with high end finishes, this home boasts 2 master suites; one on the main floor and one upstairs. Cypress Cove Covenants & Cypress Cove Covenants Amended. These documents may not be the most up to date so, before you use this information to make a decision, you need to verify that these documents have not changed. This should help you get a feel for the character of the neighborhood. With most of our owners living out of state there are a number of developments that do not have an active Home Owners Association and in some instances the restrictive covenants and bylaws are no longer applicable. 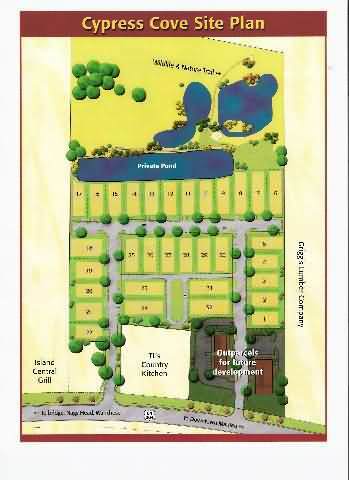 Cypress Cove Plat with the layout of all the lots in the subdivision.